recruitment. Last date to submission of application form to Chennai Metropolitan Magistrate Court, Egmore is 01-03-2019. Candidates selection is based on direct interview only for this Office Assistant Posts. Candidates will be shortlisted on basis interview marks. Based on applications scrutiny candidates will be called for interview and certificate verification. Short list of the candidates will be displayed in Chennai District Court official website of https://districts.ecourts.gov.in/india/tn/chennai/recruit. 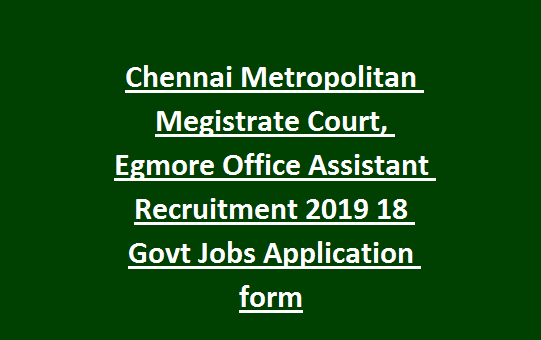 Application form format, qualification and other details about this Chennai Metropolitan Court Egmore Office Assistant recruitment is updated below. 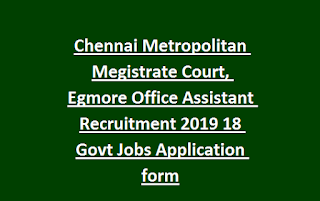 There are total 18 poss are in this Chennai Metropolitan Magistrate Court, Egmore recruitment 2019. Upper age limit for Office Assistant Posts is 30 years. For SC/ST-35 years, BC/MBC-32 years. 8th passed candidates are eligible to apply for this Chennai Court Office Assistant Posts. After receiving of applications it will be verified. And then candidates will be called for personal interview if they meet the requirements. Address details are given in notification.